114 Commonwealth is located on the south side of Commonwealth, between Clarendon and Dartmouth, with the First Baptist Church to the east and 116 Commonwealth to the west. 114 Commonwealth was designed by architect Samuel D. Kelley and built in 1879 by building contractor William Seavey Rand. William Rand is shown as the owner on the original building permit application, dated August 5, 1879. The house was built on land owned by Henry Lefrelet Daggett, a leather and shoe merchant, who lived at 116 Commonwealth. He had purchased the lot on July 23, 1879, from the estate of Francis Willard Sayles. The land previously had changed hands several times, having been purchased originally from the Commonwealth of Massachusetts on May 28, 1868, by William Munroe. Click here for an index to the deeds for 114 Commonwealth. On March 13, 1880, after the house at 114 Commonwealth was completed, Henry Daggett sold the land to William Rand. As a part of the transaction, 0.18 feet were added to the frontage of 116 Commonwealth (making it 28.18 feet on Commonwealth and 28 feet on the alley) and subtracted from the frontage of 114 Commonwealth (making it 27.32 feet on Commonwealth and 27.5 feet on the alley). This appears to have been an expedient way to correct an error in the placement of the party wall between the two properties. On the same day he acquired the land from Henry Daggett, William Rand sold the land and new house to attorney David Hill Coolidge. Henry Daggett and William Rand had engaged in a similar transaction in 1878-1879 to develop a vacant lot owned by Henry Daggett at 249 Commonwealth. William Rand built the house, also designed by Samuel D. Kelley, purchased the land from Henry Daggett when it was completed, and resold it on the same day. David Coolidge and his wife, Isabella (Shurtleff) Coolidge, made 114 Commonwealth their home. They previously had lived at 74 Chestnut. 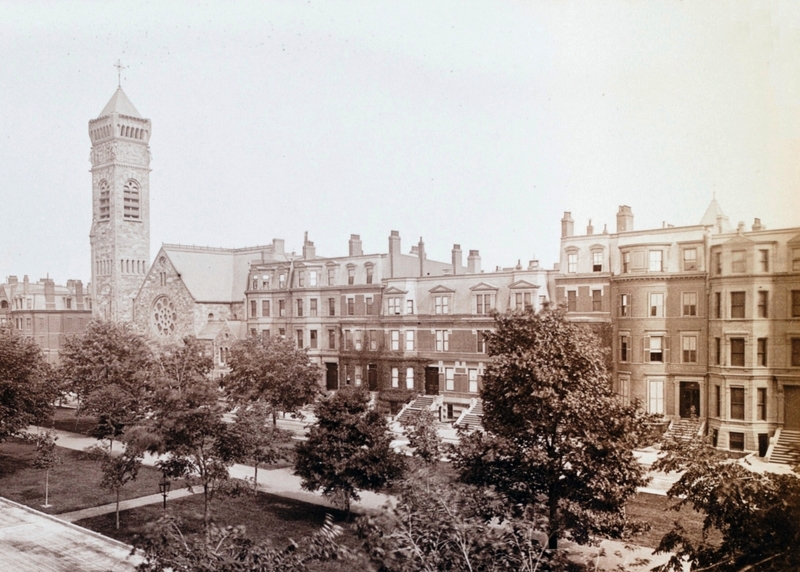 On July 18, 1882, David Coolidge sold a six inch wide strip of land at the eastern edge of his lot, to the First Baptist Church, new owners of the former Brattle Square Church at the corner of Commonwealth and Clarendon. Earlier in July of 1882, the Church had acquired the vacant lot between their property and 114 Commonwealth and planned to build a new chapel on the land. 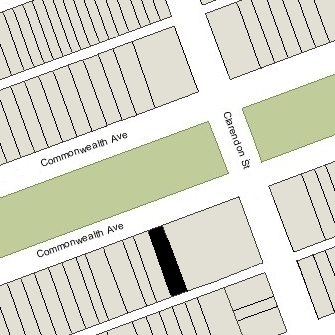 The eastern party wall of 114 Commonwealth was built entirely within the boundaries of its lot, rather than located so that the boundary line ran down the middle of the wall with six inches on the lot for 114 Commonwealth and six inches on the lot to the east, as would usually have been the case. The First Baptist Church acquired the eastern six inches so that it would own their half of the wall. The Coolidges’ four children lived with them: Charles Allerton Coolidge, Isabella Coolidge, David Hill Coolidge, Jr., and Frederick Shurtleff Coolidge. 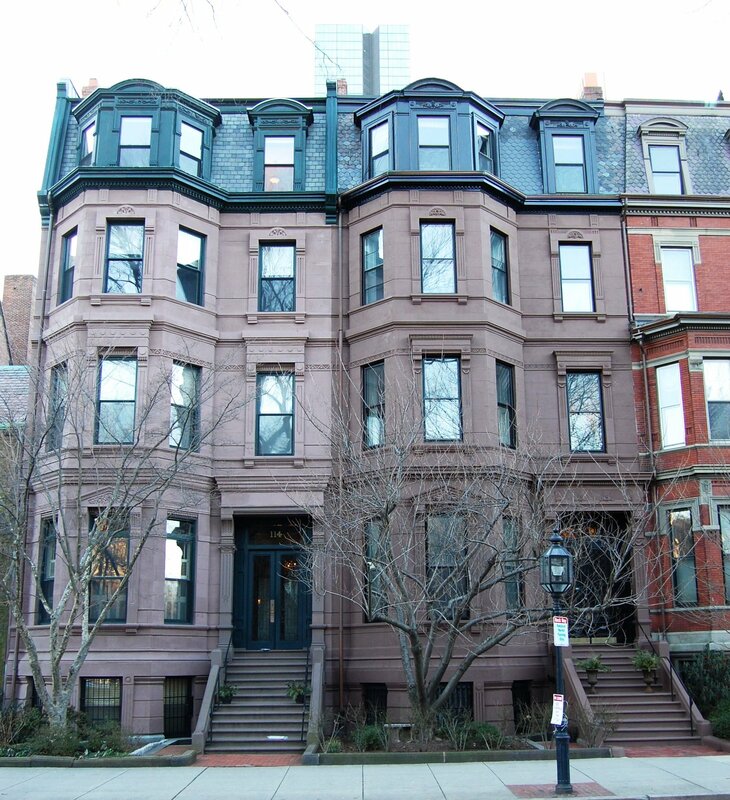 Charles Coolidge, an architect, married in October of 1889 to Julia Shepley (the sister of his partner, George Foster Shepley, in Shepley, Rutan & Coolidge) and they moved to 371 Marlborough. David Coolidge, Jr., a landscape architect, married in November of 1890 to Harriet Sears Crowninshield and they moved to an apartment at 411 Marlborough. Frederick Coolidge, a physician, married in November of 1891 to Elizabeth Penn Sprague and they moved to New York City and then Chicago. 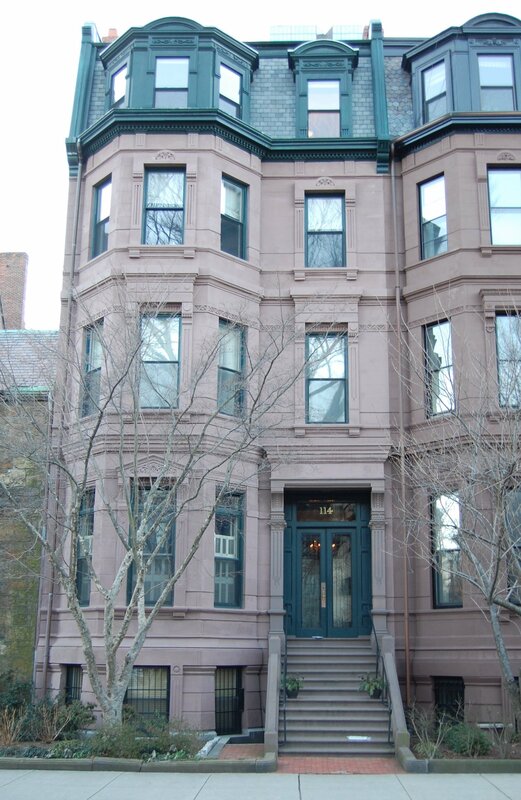 Isabella Coolidge married in December of 1894 to Dr. William Thomas Councilman, a professor of anatomy, and they moved to an apartment at 224 Marlborough and then to 457 Marlborough. In about 1898, the Coolidges were re-joined by their son, David Coolidge, Jr., who had recently separated from his wife, Harriet (Crowninshield) Coolidge. Prior to their separation, they had lived at 109 Commonwealth with her widowed father, Caspar Crowninshield, who died in January of 1897. David and Isabella Coolidge, and David Coolidge, Jr., continued to live at 114 Commonwealth until about 1904, when they all moved to the Hotel Somerset. On May 31, 1904, 114 Commonwealth was purchased from David Coolidge by Francis Blackwell Forbes. He and his wife, Isabel (Clarke) Forbes, made it their home. They previously had lived at 65 Marlborough. Francis B. Forbes had been a partner in the Boston shipping firm of Russell & Company, and had spent a significant amount of his career in New York and China (two of his children were born in Shanghai). He was also a dedicated botanist and, with William Botting Hemsley, authored a book on the plants of China. On June 24, 1904, Francis B. Forbes transferred the property to his son, Francis Murray Forbes, to the use of Isabel C. Forbes. Francis Murray Forbes and his wife, Marjorie (Cochrane) Forbes, lived in Wenham, He was a founding partners in Cabot, Cabot & Forbes, real estate brokerage and developers. Francis B. Forbes died in May of 1908. Isabel Forbes continued to live at 114 Commonwealth until her death in September of 1931. Their unmarried daughter, Ethel Anna Forbes, an artist, lived with her. In March and April of 1934, Ethel Anna Forbes’s siblings (or their heirs) transferred their interests in 114 Commonwealth to her. She continued to live there until early 1942, when she moved to an apartment at 192 Commonwealth. On February 18, 1942, 114 Commonwealth was acquired from Ethel Anna Forbes by Robert Adams Edson and his wife, Elizabeth (Gunther) Ford Edson. They previously had lived at 1283 Commonwealth in Allston. Robert Edson was a chemist. In the 1920s, he had served as a US Department of Treasury Prohibition Agent in his home town of West Brookfield, Massachusetts. In May of 1942, Robert and Elizabeth Edson applied for (and subsequently received) permission to install a fire escape on the rear of the building. They subsequently made 114 Commonwealth their home and also operated it as a lodging house. Robert Edson died in June of 1954. 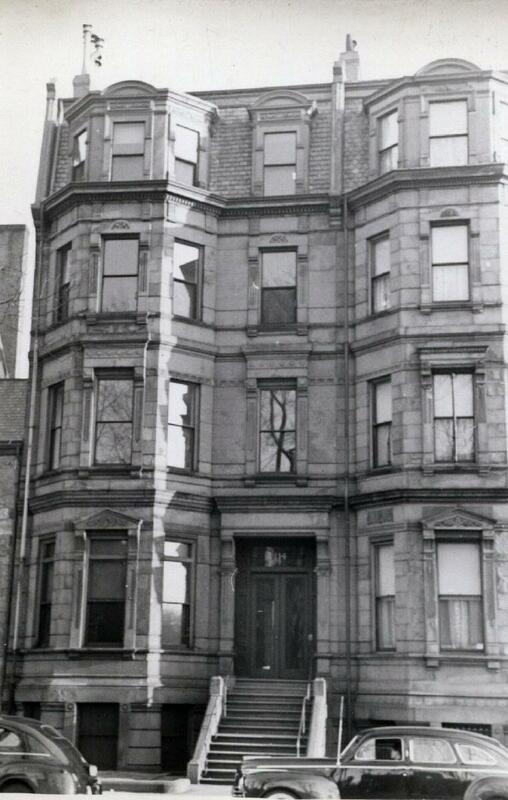 Elizabeth Edson continued to live at 114 Commonwealth and to accept lodgers until about 1977. She also operated lodging houses at 338 Commonwealth and 136 Marlborough. On June 19, 1978, 114 Commonwealth was purchased by Frederick C. Gleason, Jr., and his wife Ann (Drucker) Gleason, both architects, from Frances G. Colby, conservator of Elizabeth Edson’s estate (Frances (Ford) Colby, the wife of Charles Robert Colby, was the daughter of Elizabeth Edson and her first husband, Edward Layton Ford). In June of 1978, the Gleasons filed for (and subsequently received) permission to legalize the occupancy as five units. On February 13, 1979, the Gleasons converted the property into five condominium units, the 114 Commonwealth Condominium.